A basic search function, based only on keywords, was added to the site back in March. Today, I'm unveiling a more sophisticated search engine, allowing you to find photos, albums and articles using a variety of criteria. In addition to keywords, you can select a country, region or city, as well as a year, month or specific day to search for. Matching photos, albums and articles are displayed in fast-loading tabs on the results page, so that you can quickly find all of the relevent results. There are also some advanced options applicable to the photo search, allowing you to find photos taken at a specific time of day (for example, at night or in the evening), or shot at a specific shutter speed, aperture or ISO level. Photo results are displayed in the same way as a regular album. Browse thumbnails of your search results or click through full-size photos instead. A box on the right of each photo result provides links to the album(s) that the photo belongs to, so that you can delve further if you wish. And, throughout the site, you can now click some key data in the photo information (e.g. the camera model, or GPS device) to initiate a search for all matching photos throughout the archive. 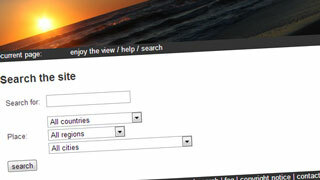 The dedicated search page is located in the help section and there is a link to it in the footer of every page. You can reach it by using access key 4. 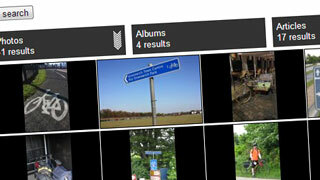 Alongside the new search engine, filters are now available to help you customise the content of existing photo albums. They offer you greater flexibility in finding the images you want. 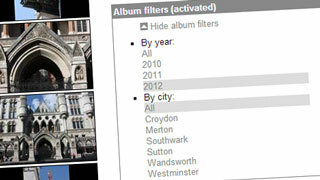 Filters allow you to display a subset of photos from within a predefined album, by selecting either a city or a year. Some albums have now been agregated to leverage the full benefits of these filters. For example, the yearly Open House London galleries have all been rolled in to one. Not only can you split them up again by year if you wish, but you can filter them by London borough instead. By using both the search engine and the album filters, you can quickly locate the photos you want and hopefully find more relevent content throughout the site. Over the next few months, more titles, comments and keywords will be added to the photo archive, in order to improve the scope of search results. Currently only 40% of images are tagged with this information but I hope to increase this considerably by the New Year.